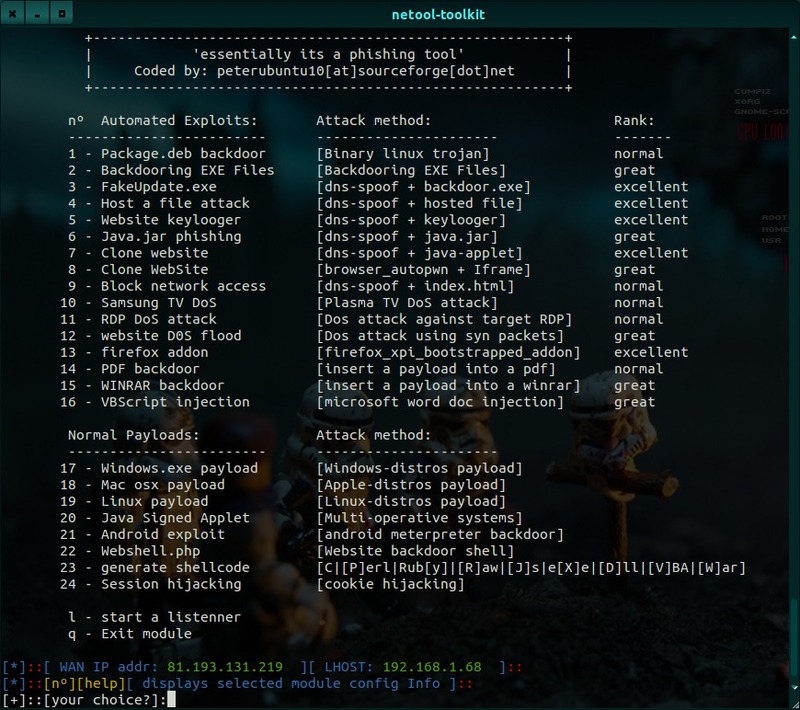 Browse: Home / Updates netool.sh V- 4.5 : MitM PENTESTING OPENSOURCE T00LKIT. + priv8.sh => “added” ‘use host-a-file-attack’ OR ‘start a listenner’module to all non-automated exploits. Netool: its a toolkit written using ‘bash, python, ruby’ that allows you to automate frameworks like Nmap, Driftnet, Sslstrip, Metasploit and Ettercap MitM attacks. this toolkit makes it easy tasks such as SNIFFING tcp/udp traffic, Man-In-The-Middle attacks, SSL-sniff, DNS-spoofing, D0S attacks in wan/lan networks, TCP/UDP packet manipulation using etter-filters, and gives you the ability to capture pictures of target webbrowser surfing (driftnet) also uses macchanger to decoy scans changing the mac address. 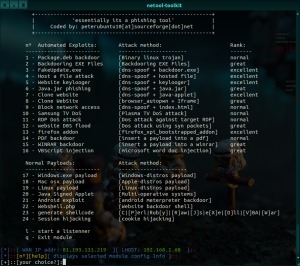 Rootsector: module allows you to automate some attacks over DNS_SPOOF + MitM(phishing – social engineering) using metasploit, apache2 and ettercap frameworks. like the generation of payloads,shellcode,backdoors delivered using dns_spoof and MitM method to redirect a target to your phishing webpage. Linux-Ubuntu | Linux-kali | Parrot security OS | blackbox OS | Linux-backtrack (un-continued) | Mac osx (un-continued). or simple the use of external scripts. "8-r00tsect0r automated exploits (phishing - social engeneering)"
"19-Common user password profiler [cupp.py]"
← Updates Unicorn v-2.1.1 – a simple tool for using a PowerShell downgrade attack and inject shellcode straight into memory.